add more living space to your garden or keep the car dry. 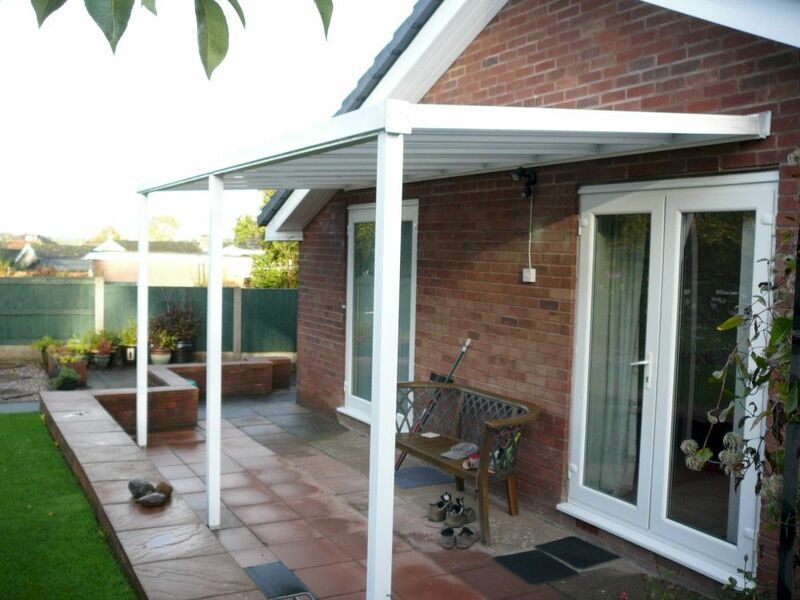 All packs come complete with upright posts 2.5m as standard and gutter packs are provided with each canopy roof in either white or brown as ordered. Canopy 2.0m Projection 2.4m length is ideal for walk ways or over door canopies and patio canopies Canopies which are virtually unbreakable - strong, long term maintenance free, Each canopy has twin wall polycarbonate sheets, 600mm wide, available in clear, opal or bronze, which carry..
Canopy 2.0m Projection 3.0m Long is ideal for walk ways or over door canopies and patio canopies Canopies which are virtually unbreakable - strong, long term maintenance free, Each canopy has twin wall polycarbonate sheets, 600mm wide, available in clear, opal or bronze, which carry a ten ..
Canopy 2.0m Projection 3.6m long is ideal for walk ways or over door canopies and patio canopies Canopies which are virtually unbreakable - strong, long term maintenance free, Each canopy has twin wall polycarbonate sheets, 600mm wide, available in clear, opal or bronze, which carry a ten ..
Canopy 2.0m Projection 4.2m long is ideal for walk ways or over door canopies and patio canopies Canopies which are virtually unbreakable - strong, long term maintenance free, Each canopy has twin wall polycarbonate sheets, 600mm wide, available in clear, opal or bronze, which carry a ten ..
Canopy 2.0m Projection 4.8m long is ideal for walk ways or over door canopies and patio canopies Canopies which are virtually unbreakable - strong, long term maintenance free, Each canopy has twin wall polycarbonate sheets, 600mm wide, available in clear, opal or bronze, which carry a ten ..
Canopy 2.0m Projection 5.4m long is ideal for walk ways or over door canopies and patio canopies Canopies which are virtually unbreakable - strong, long term maintenance free, Each canopy has twin wall polycarbonate sheets, 600mm wide, available in clear, opal or bronze, which carry a ten ..
Canopy 2.0m Projection 6m long is ideal for walk ways or over door canopies and patio canopies Canopies which are virtually unbreakable - strong, long term maintenance free, Each canopy has twin wall polycarbonate sheets, 600mm wide, available in clear, opal or bronze, which carry a ten ye..